Notable figures mourn the former mayor of Toronto. Photo by Canon Ma from the Torontoist Flickr Pool. In the wake of Councillor Rob Ford’s death, former colleagues, friends, and politicians from across the country turned to Twitter to share their condolences. Sincere condolences to Rob Ford’s family during this difficult time. 46 is far too young to lose a loved one. Wishing @TorontoRobFord and his family strength and love. My deepest condolences to the family of my colleague Rob Ford. Sadly too many families are losing their loved ones to cancer. I lost my mom last year to cancer & know how painful it is to lose someone you love. My most heartfelt condolences to Rob Ford’s family. Simply devastating news. My heart goes out to the Ford family. Rob was a fighter until the very end. I'll miss him on the Council floor. Sad news that Rob Ford has passed away. My thoughts are with his family at this difficult time. Shocked to hear of the passing of Rob Ford. My thoughts and sympathies are with his family, especially his children Stephanie and Doug. 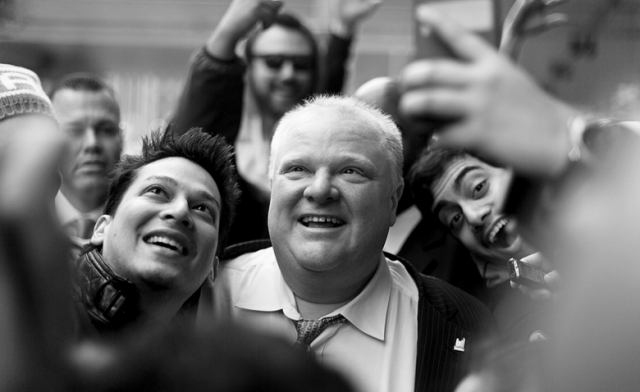 My condolences to former Toronto Mayor Rob Ford's family, following his battle with cancer. May he rest in peace. Condolences to the #Ford family on this day. My deepest condolences to the family of Rob Ford. Condolences to the family and fans of @TorontoRobFord - an unforgettable guy who loved his job and city like few men I've met.